Utilizing dozens of primary source works, With Firm Reliance plunges deep into the dust-covered volumes of American history to discover how Christianity fundamentally impacted America’s beginning. 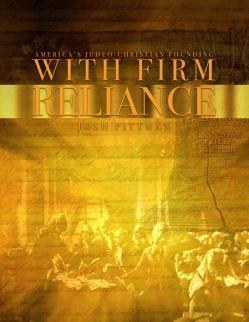 Discover the faith of the Founding Fathers, the significant role pastors played in the fight for Independence, and the impassioned prayer at the start of the First Continental Congress. "This important work contains dozens of pertinent quotes to strengthen our resolve and embolden our children to reclaim Christ for future generations. . . I highly recommend this e-book to supplement history and social studies. I learned many excellent truths from this work, and I am thankful to use this resource in my own homeschool." "This is a marvelous resource to supplement your American History, American Government, Constitution or other social studies courses. I am very excited about this resource and intend to use it with our history courses this school year."